After an education in art history and fine arts, David Berlow entered the type industry in 1978 as a letter designer for Mergenthaler, Linotype, Stempel, and Haas type foundries. He joined the newly formed digital type supplier, Bitstream, Inc. In 1982, where he eventually worked in the type, type marketing and type technology departments. After Berlow left Bitstream in 1989, he founded The Font Bureau, Inc. with Roger Black. Font Bureau has since grown to a small company participating in more than 500 custom and OEM font, projects and in a retail font business for desktop and web, now as part of Type Network Inc. Berlow is a member of ATypI, the Society of Type Aficionados, and works from his home studio in Massachusetts as a type designer, type design manager, font software advocate and marketing enthusiast. He is an owner and board member of Font Bureau and of Type Network Inc.
David will be speaking at the final #tptalks for 2018. To join us, please register here. You have had a long and very successful career in type design. What about your work has brought you the most most joy? 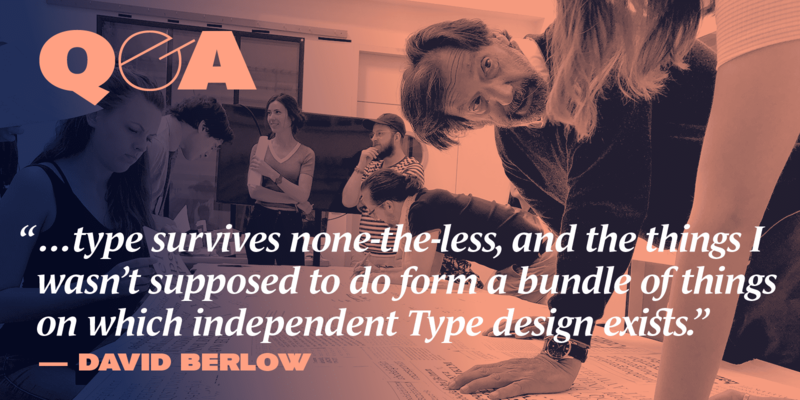 David Berlow Most people don’t know this, but once every 5 years or so since I’ve been in Type design and typography, someone has found out what I was doing and said, “Berlow is going to ruin the type industry.” Interactive editing of shapes, copying and pasting things, using Fontographer, supporting TrueType, making Variable fonts… Type survives none-the-less, and the things I wasn’t supposed to do form a bundle of things on which independent Type design exists. Let’s dream for a moment: Can typeface design survive if technical limitations are lifted entirely? How would the craft be different? I’m not sure what it means to lift the limitations of technology, but to levitate them to a kind of typographic buoyancy, for less complex use by a wider audience is on the horizon. Communicating typographically without 4 years of design ed and 10 years of typographic practice is, after all, what evolution is about. That’s a great question. I read a lot of diverse material on topics outside of, or only distantly related to type, and don’t spend much time on type in social media, which I think keeps my interest in the field. Environmentally, I’ve been very comfortable working from one building, home, for a long time, and I only move my office around in the house once every seven years or so. Styles and projects have to be typographically managed pretty carefully though. Large Sans families, I need sometimes to open the hatch and go for a jaunt through something serif. Depending on how bad this is, I.e. how long the sans has lasted, I might have to draw some old style italic or a script to stop the sans’ noise. These jaunts are usually is accomplished by drawing 5-10 glyphs, and then having a nap. Working on two large sans families at once requires more serif diversion, a meal and a night in between working on the two. Working on variable fonts uses a different mind set, and needs a different kind of shake-up to move from one design space to another. I will let you know when I figure that one out. In your professional life, do you like to plan ahead, and set specific goals and timeframes? Or do you prefer to stay flexible, and leap upon opportunities (even those that significantly alter your path) as they arise? Getting out into type-free Natural Surroundings, I think, does the most to relax me. Years ago living in Boston, I had to make do with an aquarium full of fish. Now, living in a more rural environment watching a Beach, a swamp, a Forest, or a bird bath, all fairly close to my office, does the trick. Environmentally, I’ve been very comfortable working from one building, home, for a long time, and I only move my office around in the house once every seven years or so. What is your hot take on variable fonts? What part will they play (or not play) in your work? Great technology, bad release. They have been some part of my work since the early 90’s, now it is most my type work. I think it’s the most powerful technology and type since digital outlines. It’s most important effect will be to undo most of the ill effects digital outlines brought with them. As a user of type, are you always on the lookout for new typefaces? What are some things that grab your eye the most when you are searching? (e.g. marketing copy, in-use specimens, OpenType features, glyph set, language support etc). I’m not really on the lookout for new typefaces to use. Most the time I’m trying to figure out how to best use the typeface I’m working on or I’ve been asked to comment on. What drives you to make new typefaces? User issues with ease of use, functionality, quality and performance in their type. What is your ratio of self-initiated typefaces vs. typeface commissions? Which do you tend to be more passionate about making? Pretty much all of my work is commission or advancement of existing, self-initiated designs that need to be updated. Not a tv watcher, I like long movies without cgi, big books, like Leonardo da Vinci and a history of Central Asia. Up before dawn, work on “whatever” for 8 hours, nap, work for 7 hours. Sleep. What is your favourite way to start your day? What is the first thing you do when you sit down at your desk? I usually dive right into mail or Robofont, and then I have to stop myself or my coffee will be cold. I do all my font work on a desktop and write, test and manage as much as possible from an iPad. Do you have any words of wisdom for someone wanting to become a designer / type designer / art director? No matter what you believe about typography, someone will disagree with you and most likely find some exception to your belief, except if you believe what I just wrote.